Mud Lake is accessible from Smoky Lake via the Still River system. Contrary to its name, the lake is very clear, shallow , rocky and without much weedgrowth. Its rocky shorelines are littered with deadfalls, logs and stumps, making it essential to fish each piece of cover methodically. 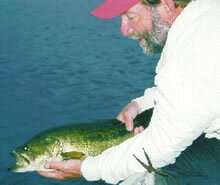 The lake also has some very fast-breaking shorelines, points and shoals which regularly hold bass. When fishing at Mud Lake, don’t overlook the opportunity to spend a couple of hours fishing Doe Lake – a great largemouth lake in its own right. With clear, shallow water and lots of wood, a spinnerbait may be the very best way to quickly locate bass. However, with so much cover (logs, stumps, beaver lodges), it is just as important to probe the shoreline cover with a slow bait – specifically a plastic worm or lizard. Largemouth bass and pike will surely be in and around such cover and will readily strike. Off the shoals and deep points, fishing live bait is a proven approach here.